Rangers today completed our fourth immediate signing of the January window in securing 25-year old Matt Polster. 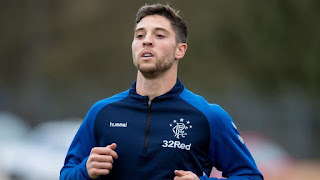 There’s been a real lack of fanfare about this signing, with most fans unaware of his football pedigree, so let’s have a look at what Rangers fans are getting in the former Chicago Fire player. 1: He’s a utility player. He has been signed for quality cover and competition at both right back and defensive midfield – which is a strange one given we have two decent options in Tavernier and Flanagan defensively, and a positive glut of defensive midfielders, which is why Jordan Rossiter especially is so close to leaving. But he’s certainly versatile. 2: He’s a USA international, albeit like Flanagan and Katic (plus a few others) has only actually received the one cap for his nation. And barely two or three call ups. It’s a stretch to call him an international in truth. 3: Like a tonne of signings in the summer of 2017, this is Polster’s first club outside his homeland, where he’s played mainly for the Fire since 2013. Let’s hope he adjusts quickly to being so far from home. 4: He has also got extensive experience at centre half, where he’s regarded as composed and polished on the ball. So much so that his former team ditched him from the rear and pushed him forward to the holding role ahead. 5: At the Fire he was mostly a RB, and a huge injury in 2017 completely wrecked his season and weakened the team – he was regarded as a massive player for that slot. It’s not a signing we can be overly fussed about in terms of his name, and his CV isn’t bursting with accolades, but it seems a solid addition and he appears the kind of player managers really appreciate. I suspect this is to cover the eventual selling of Tav. seeing how bad Flanagan was in the friendly against Helsinki I'm pleased they got in cover at right back. Fair play to Tav for playing so many games but bound to need a rest sometime before the end of the season.